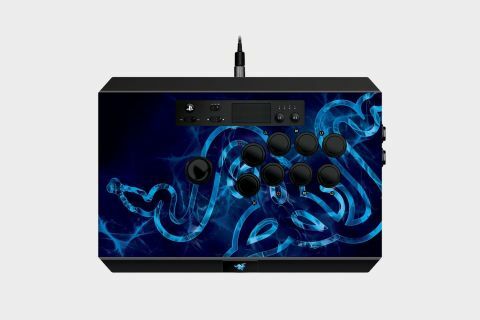 A mostly impressive $200 stick for the dedicated fighting game fan, even if it could be a little simpler to set up on PC. The Razer Panthera arcade fightstick offers a fresh reminder that fine motor skills aren't always to be trusted with the complex controls involved in competitive gaming. The difference between making a full sweep with your wrist versus just the tip of your thumb, or mashing a pair of buttons with two fingers versus just the tip of your thumb again, is readily apparent when you switch from a controller to a fightstick. After dusting off my thumbs to give fighting games a try for the first time in a while, I've been impressed by how different the experience is with a fightstick. Razer's Panthera may at first seem like gaudy throwback to retro arcades, but experiencing a fresh set of Sanwa buttons and an unused Sanwa joystick in the comfort of your own home without any quarters on the line gives you time to appreciate the hardware. Razer has put together a sturdy and simple box that's ready to give its all to fighting games. At $199 (£199.99), it's not an easy purchase to justify for most players. Though a specialized game controller like the Xbox Elite controller can also cost a fat sum, it has the benefit of being useful with more games. If you're really into fighting games, though, the cost probably won't be an issue. Out of the packaging, the Panthera looks like a plain box with some buttons and a joystick. The standard model has Razer's logo slathered over the front in a PlayStation-inspired blue, eight face buttons labeled with the PS4 controls they're bound to, a ball top joystick, and a section for a number of less common controls (like the touchpad, R3, L3, and a few special toggles just for the fightstick). The Start and Select buttons hide on the right side of the box where they won't interfere with the action. On the front lip, a lit Razer logo doubles as a release for the lid. Inside, the Panthera's elegance is on full display. There are quality hinges, a smooth pneumatic piston to hold the lid open, and wiring that's simple and clearly labeled. There's also a slot for storing the braided USB cable, the included screwdriver, and the extra joystick head. Closing the lid, the rest of the Panthera doesn't feel as elegant. The seams around the lid aren't perfectly lined up, and that issue applies equally to the seams around the perimeter of the plastic top plate, which itself is a magnet for finger and palm prints. On the plus side, the rubber grip covering the bottom of the Panthera does a great job of keeping it in place. The Panthera has a long braided cable well suited for a lengthy run from wherever you're sitting to your PC. It screws into the back of the Panthera's case, but the stem of the cable awkwardly sticks out over an inch. A choke at each end of the long cable to prevent signal interference shows Razer has performance in mind with even minor aspects of the design. Build and design nitpicks aside, the real focus of the Panthera is game performance, and the Sanwa hardware does a superb job. The joystick feels incredible to jostle around. It gives audible and tactile clicks when it actuates, and getting to use larger arm motions makes executing quarter circles almost easy. The larger, spaced out buttons also dramatically change things. I find I can do a quick succession of taps with separate fingers to throw out a combo that would have otherwise been a frantic rush for my thumb on a standard controller. And, after a lengthy play session, I don't feel like I've pushed myself that much closer to arthritis. The Sanwa buttons come with their own little learning curve. These are the touchiest buttons I think I've ever used. Just hovering my pinky over one and giving it the slightest glance will actuate it. The implications for responsiveness in fighting games are clear, but somewhat careless, ham-fisted gamers like myself will have to learn to keep their fingers raised. As great as it feels to use the Razer Panthera in fighting games—I've had a blast trying it with Dragon Ball Fighter Z—everything is sadly complicated on PC. I didn't have a plug-and-play experience with the Panthera, which I somewhat expected from PlayStation-aimed hardware, despite the noted PC compatibility. Though Windows recognizes the Panthera and Steam identifies it as a PS4 controller, I couldn't immediately use it in the few games I tried. The largely similar Razer Atrox for Xbox One fared even worse, with Steam failing to even detect a controller. I got the Panthera working two different ways. One way was as a generic gamepad in Steam, which required mapping all of the controls. The alternative was downloading and installing Razer's Xinput drivers, at which point Windows and Steam considered the Panthera to be an Xbox 360 controller. As perfectly workable as this solution is, it complicates learning a new game. When a tutorial says “Press X,” it can be hard to remember to actually press Square. I'm regularly annoyed with the bait-and-switch of on-screen Xbox controls when I'm using a controller labeled for PlayStation. But, the actual fighting experience as I thwack the buttons for a light-medium-heavy combo attack and land an equally strong succession of hits (even if I was supposed to do a different combo) is so responsive, rewarding, and easy to execute, I don't think I'll switch back to a controller any time soon.